I have been eating spicy foods all day today. They seem to be the only things that I can taste due to the unfortunate luck of catching a cold yesterday. I am such a baby that I would almost rather go through another c-section recovery than have a bad cold. Part of it has to do with having pneumonia and being hospitalized last winter. Now every time I get a cold it feels as if someone is sitting literally on my chest. Before having pneumonia this never happened. I was warned that this would happen, but it still doesn't make the experience any more pleasant. So I have been taking zinc lozenges, drinking tea with honey and trying not to be too pathetic. My husband was super sweet and brought me home a bag of spicy chips, spicy peanuts and chocolate. I knew there was a reason I married that man, sometimes he is just plain awesome. Since I have been feeling under the weather I am glad that I baked a number of snacks earlier in the week. 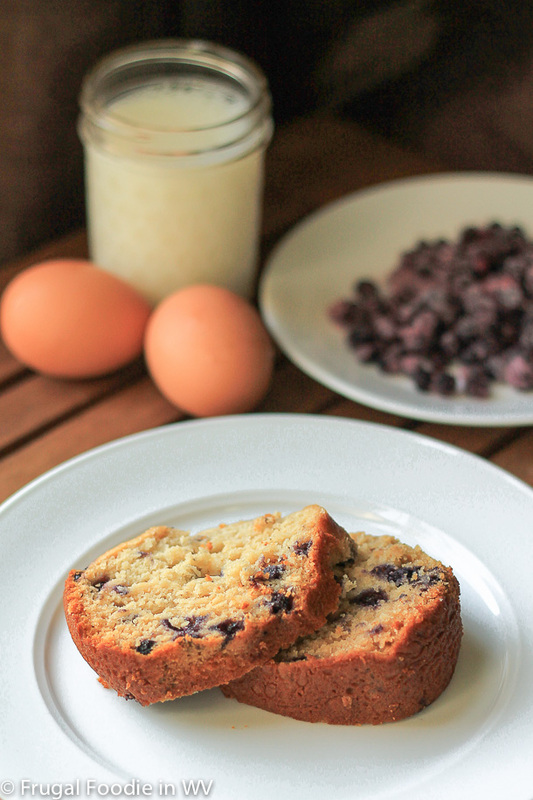 One of my favorite ingredients to bake with is blueberries, whether fresh or frozen they are delicious. This week I tried a new recipe from the February/March 2013 issue of Taste of Home Magazine for Lemon-Blueberry Pound Cake. This recipe has 13 ingredients in the cake and 2 in the glaze. It takes an hour and 20 minutes of total time, 25 minutes of which is active and makes 12 servings. I did make a number of changes to the original recipe. First since I eat gluten free I used brown rice flour to replace the all-purpose flour. I have also been trying to cut down on the amount of granulated sugar that my family consumes so I substituted honey for the two cups of sugar. Since less honey is needed in recipes I reduced the total amount to 1 1/2 cups and used 6 ounces instead of 8 ounces of lemon yogurt. Finally, instead of butter I used canola oil and low-fat cream cheese instead of regular. I found that my baking time was slightly longer due to the changes, approximately 5 minutes total. While the frosting looked yummy, I left it off to reduce the amount of sugar. I followed the remainder of the recipe as written. My two boys loved this pound cake. Even with all the substitutions the cake came out very well. It wasn't as sweet as the original recipe would have been, which I liked. Using two cups of sugar would make for a very sweet cake and I prefer a cake that is a little less sweet to serve to my kids, plus it was great with a cup of tea as a snack in the afternoon. For the recipe go to Lemon Blueberry Pound Cake. Oh, that looks so fluffy! It turned out really fluffy, which was great! YUM. Can't wait to try it! It really did turn out yummy! If you try the recipe tell me how it turns out! We love blueberries in our house. We go blueberry picking every summer and freeze a whole bunch of them so that we have them to bake with throughout the year. I am jealous of the blueberry picking, that is awesome! This is right up my blueberry obsession way! hope you feel better. the recipe is yummy. i like baking with yogurt...makes dessert less guilty! Thanks, I am feeling better today! I love baking with yogurt also, it's a great way to cut down on the fat! It's looking yummmmy! I'll try it. I love cakes too :) Thanks for the nice comments and the follow! This looks delicious! Thanks for sharing on Foodie Friends Friday. Please stop back by today to vote.